Your church needs a sign, and there are a lot of different options. You can opt for a classic light box or changeable letter sign, but if you really want to make a splash, you should consider an LED church sign. 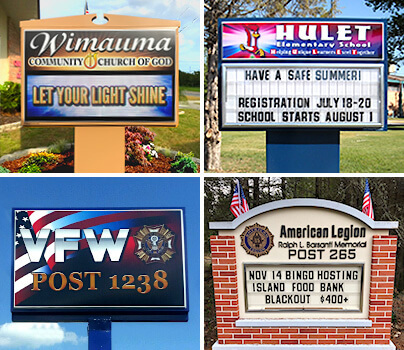 To help you decide whether you should go digital or stick with more traditional signage, here's a look at how LED church signs compare to other types of church signs in a variety of categories. Keep reading to find the perfect sign for your church. The main point of a church sign is that it announces your church to the world. A simple light box sign can feature your church name and select graphics, and because these signs are lit from the back, they are visible both day and night. That's all you need if you just want to let the world know about your church. However, to enhance your messaging, you may want to integrate light box elements with other types of signage. In particular, you can add a changeable letter area to your light box sign, or you can opt for a digital sign with a light box section. In addition to letting people know about your church, signs also let you share unique messages with your community. With a changeable letter sign, you can post a variety of short messages. With an LED church sign, you can also share short messages, but you can set up the sign to cycle through a variety of different messages throughout the day. If you want to share numerous messages, an LED sign is the best option. As a general rule of thumb, LED church signs are more expensive than changeable letter and lightbox signs. However, these signs are also an investment into your church. Many churches experience an uptick in new families attending their services after they install a new digital sign, and the sign provides you with marketing opportunities that you can't get through TV, radio, or newspapers. That said, once you own an LED sign, you also have to pay for electricity costs, but LED technology helps to keep those costs as low as possible. When thinking about costs, remember to take into account the time needed to manage your sign. With a changeable letter sign, you have to manually change the sign, and every time you need to put up a new message, you should expect to spend about 30 minutes to an hour on that process. In contrast, an LED church sign fits easily into your day. You simply open the sign management software on your device, enter your new message, and send it to the sign with the tap of a button. If you're changing the time of service, adding a new prayer group meeting, or needing to make other important announcements, you can dispatch those messages quickly and easily. With LED church signs, written messages are just the beginning. You can also play media on many of these signs. If you want to show a clip of your praise and worship service or of your church members doing work in the community, you can easily upload that video to your sign management software and broadcast it on your sign. Other church signs don't give you this level of tech interactivity. Due to the multiple functions offered by LED church signs, many churches put these signs inside as well as outside. In most cases, it doesn't make as much sense to have a changeable letter or a light box sign inside your church. However, indoor LED signage can be used in the lobby to share special announcements, in classrooms to facilitate lessons, and even in the sanctuary to increase visibility for people in the back or to add special effects and visuals to the service. You don't need to learn how to use a light box sign. You simply order it, have it installed, and enjoy its ability to let people know about your church. Similarly, with a changeable letter sign, you have to figure out how to open the case and put in the letters, but for the most part, that's fairly simple and straightforward. With an LED church sign, in contrast, there is a bit more of a learning curve, and it takes a few more tips and tricks to update the sign. Luckily, however, the software is set up to be intuitive and simple to learn, and most users have an easy time embracing the technology. As you select your sign, consider how it's going to look to current and prospective congregants. Are you trying to attract a young, tech-savvy crowd? Then, an LED church sign is probably the best choice. Do you want to lend an air of prestige and traditional style to your church's exterior? Then, you may want to combine LED church sign technology with a monument style sign which features a masonry-inspired frame, an ideal complement to the beautiful brick exterior of your church. Trying to make a different impression? Then, you may want to look at other types of church signs. Putting up a new sign at your church is a big decision, and you deserve to work with an experienced sign company who can guide you through the selection process. To customize a sign for your church, contact us today. At Stewart Signs, we offer light box signs, changeable letter signs, monument signs, and LED church signs. We look forward to working with your organization and helping you get your messages into the community.